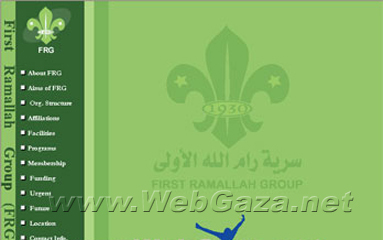 First Ramallah Group (FRG) - What is First Ramallah Group? The First Ramallah Group (FRG) is an independent, non-governmental, non-profit organization. It is not affiliated with any political, religious or other party, and serves as a multi-purpose cultural, social and sports center. The activities of the FRG work towards the enhancement and strengthening of the capabilities of Palestinian youth through the belief in the values and ethics of scouting in order to effectively contribute to the building of Palestinian civil society. The FRG was established in 1930, originally by a scout group of men from the city of Ramallah, and in 1964 women became active members of the group. Based in Ramallah, the center attracts many residents and visitors to the city, as well as anyone interested in spending time with friends or family in a multi-purpose center of culture and heritage for children, youth and adults. Its facilities are used by many groups and individuals, although the largest concentration of activities is focused on its members. With the absence of a Palestinian State and government throughout the years of Israeli occupation, services provided by Palestinian NGOs and institutions such as the FRG have been indispensable. Today, the FRG aims to develop its center and programs for a wider number of people. Events organized by the FRG include cooperation in the annual Palestinian International Festival for Dance and Music, a series of performances by the center's dance troupe, Sirriyet Ramallah, and participation of its sports teams in various sports competitions within Palestine and abroad. The Center also offers various fitness classes, swimming programs, Dabkeh dance classes and lectures.